City Lodge Hotel is a three star hotel conveniently located on Sukhumvit Soi 9. The hotel is right at the start of the soi, making it one of the most convenient in the area for accessing Nana BTS. From City Lodge, it’s a short walk through the BTS station and down Sukhumvit Road to Soi 4 and Nana Plaza. 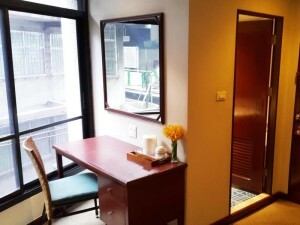 Rooms are fairly simple but offer a comfortable sleep and are sheltered from the noise of Sukhumvit Road and the BTS station. Free Wi-Fi is provided in all rooms and throughout the hotel. A good low-cost choice that’s very close to the BTS Skytrain.